Overview - HBO premieres eight new episodes of the half-hour comedy series about a deluded, burned-out, former major-league pitcher named Kenny powers, who after fleeing his hometown in North Carolina spent a soul-searching season in Mexico as "La Flama Blanca" - and ended up returning to the States as a changed man. Or is he? Picking up a year after Season 2 ends, the still-audacious Kenny brings his "f*#ked up behavior" to Myrtle Beach, SC - a tourist destination filled with firework stores, mini-golf and underage boozing - and somehow resurrects his baseball career as the closer for the minor-league Myrtle Beach Mermen. Normally, I'm pretty ambivalent toward comedies that feature thoroughly repulsive protagonists with little to no redeemable qualities. More often than not, their shocking behavior becomes an easy source of empty laughs at the expense of actual character, robbing their stories of anything to invest in. With that said, there have been two notable TV series that continually manage to win me over not just in spite of, but actually because of their characters' outrageous depravity. One of these shows is FX's long-running tale about high-functioning sociopaths ironically dubbed 'It's Always Sunny in Philadelphia.' The other, is HBO's gleefully shameless 'Eastbound & Down.' Vulgar, offensive, and hilarious, the show features one of TV's most detestable yet somehow oddly captivating "heroes." He may be far from a role model, but there is no denying the sheer unholy awesomeness that is Kenny "F#&%ing" Powers. After an amusing detour to Mexico in season two, disgraced pitcher Kenny Powers (Danny McBride) continues his slow return to baseball stardom -- this time in Myrtle Beach, South Carolina. Now given the opportunity to play for the city's minor league team, Powers concentrates on fighting off a potential rival (Ike Berinholtz) while he spreads his special blend of wild belligerence throughout the coastal town. All the while, he callously neglects his one year old son, Toby, throwing all the responsibility to the boy's mother, April (Katy Mixon). After a crazy night of partying together, April abruptly skips town, leaving the defenseless child in Kenny's care -- a predicament that proves to be just as hilarious as it is terrifying. While the above scenario might sound like a typical sitcom setup, as anyone familiar with the show might expect, the execution is anything but conventional. In fact, though it's far from a groundbreaking twist, placing a baby anywhere near Kenny Powers turns out to be nothing less than a comedic stroke of genius. There are few characters on TV more ill-equipped for fatherhood than Kenny, and much of the season's funniest moments come from his unusual parenting techniques. This leads to several hysterically inappropriate decisions and sight gags that are sure to both shock and amuse viewers. To give you a taste of what I mean, I'll leave you with four words that pretty much sum up the full extent of Powers' childcare skills: baby in a backpack. I know child endangerment might not sound like a healthy source of laughs, but the writers really do some clever bits with the concept, and they blend just the right amount of exaggerated depravity with wayward heart to make it all work. Throughout the show's first two seasons we've seen McBride's abrasive, down-on-his-luck pitcher flirt with actual humility and maturity. At the start of season three, however, any of this previous growth is essentially washed away. The burgeoning success Kenny's found has caused him to completely regress, inflating his ego and his destructive behavior. While I was initially frustrated by this step backwards, it's understandable given the character's established personality, and in order to keep the series' unique sensibilities intact, there just might be limits as to how much he's allowed to change. Of course, despite his many reprehensible choices, Kenny isn't a complete monster, and he slowly develops a genuine bond with his son. With that said, the show avoids any semblance of traditional sentimentality, and while this might've been a cause for concern on any other series, for 'Eastbound & Down' it actually turns out to be a wise decision. While some faint sweetness does creep in every now and then (especially in the finale), the writers resist the urge to neuter McBride's infamous man-child persona. Hell, if anything, there are times in which they seem to go in the complete opposite direction. Outside of Kenny's headshaking attempts at parenthood, these eight episodes are packed with an assortment of bizarre and delightfully offensive subplots. Covering everything from baseball rivalries to family reconciliations and biker gang showdowns, there's rarely a dull moment in the bunch. The series continues to push the boundaries of politically incorrect content, and the humor retains a riotously twisted, raunchy, and often dark edge. Likewise, Powers' ridiculous voice-over ruminations return to further delight audiences with more quotably inappropriate philosophical ponderings. Directors Jody Hill and David Gordon Green also keep up with the series' trademark stylistic flourishes, offering frequent slow-mo shots and quick cutting montages all set to an eclectic soundtrack. Like in previous seasons, a cavalcade of talented guest stars stop by to lend their own comedic sensibilities to the mix -- including Jason Sudeikis, Craig Robinson, Ike Barinholtz, and Matthew McConaughey. Don Johnson reprises his role as Kenny's absentee father, and in a welcome addition, he is now joined by Lily Tomlin as the Powers' matriarch. Will Ferrell also makes a memorable return as the nefarious Ashley Schaeffer, who has now traded his BMW dealership for a Kia retailer (according to him, it's "a vastly superior machine"). His attempted revenge on Kenny and Stevie -- which involves a Geisha costume and lots of canon fire -- is among the season's highlights. Series mainstays Steve Little and Katy Mixon continue to do great work in their parts, and both actually get to flex some dramatic muscle in their arcs. Star Danny McBride once again brings Kenny Powers to life with the same unbridled passion and crass absurdity that fans have come to expect, and despite the aforementioned regression, the character is forced to go down an interesting emotional path that may finally result in some permanent growth… maybe. The show tends to be at its best when Kenny is at his worst, and Powers' outrageous, juvenile, and selfish behavior is a large part of what defines the series. Unfortunately, there are some occasional issues with this approach. While I enjoy the show's unapologetically raunchy tone, I must admit that the non-stop vulgarity does sporadically overstay its welcome. I wasn't actually offended by any of the foul language or depraved situations, but the constant cursing eventually loses its novelty and instead of being shocking, funny, or clever, there are times when it becomes rather tedious. Not all of the episodes are clear winners either, and despite some strong work by Johnson and Tomlin, the Powers family reunion in episode six proves to be a little disappointing. The finale also seems to be pretty divisive among fans -- with a conclusion that borders on the schmaltzy side (though, in an appropriately dark and very twisted way). Thankfully, these aren't major concerns, and as a whole the season is essentially on par with the show's previous two outings. Taking Kenny Powers to both new highs and lows, 'Eastbound & Down: The Complete Third Season' sees the character waver between moral regression and legitimate growth. Powers' unwitting plunge into fatherhood throws an inspired curve ball at the status quo, resulting in a comically warped yet faintly endearing journey. Season three was originally supposed to be the show's last, and with that in mind there is indeed a clear sense of finality here. Though a fourth season is now planned, these episodes offer a satisfying arc for Danny McBride's unruly creation. I just hope that future installments continue to evolve the character without losing all the vulgar depravity that makes him so special. HBO presents 'Eastbound & Down: The Complete Third Season' on two BD-50 discs housed in a standard case that comes packaged in a slipcover. After a streaming promo for HBO, the discs transition to standard menus. The show is provided with a series of 1080p/AVC MPEG-4 transfers in the 1.78:1 aspect ratio. Bright and vibrant, the video has a colorful but slightly harsh look. The series is shot on 35mm, and the print is in great condition, with only a few minor specks visible here and there. Natural grain is present, but it's a little inconsistent in appearance, ranging from light to heavy depending on the sequence. Clarity is very good, and the various Myrtle Beach locations offer some pleasing pop. A rowdy Fourth of July party is a real highlight, and features striking lighting design and fireworks. Colors are vivid and oversaturated, and contrast runs hot throughout with bright whites. While this gives the image a frequently vibrant appearance, the overly aggressive look can also rob the picture of some depth. Thankfully, black levels remain steady and deep. With the exception of some very minor shimmering around tight patterns, I detected no major artifacts. Vivid but a little uneven, 'Eastbound & Down' comes to Blu-ray with a strong transfer. The video can look a tad flat, but detail is sharp, successfully rendering Kenny Powers in all his bawdy glory. The episodes are presented with English DTS-HD MA 5.1 mixes, French DTS 5.1 mixes, and Spanish DTS 2.0 mixes with optional English SHD, French, Spanish, Finnish, and Norwegian subtitles. Mirroring the protagonist's own crude bravado, the audio has frequent bursts of unruly immersion. Speech is clear but there is some minor peaking every now and then. The track itself also seems to be mixed a little high compared to most other titles. Though frontloaded at times, the soundscape is energetic and wide when called for, bringing the beach locals to life through appropriate ambiance, including crashing waves and squawking gulls. Roaring engines, zooming pitches, and canon fire explode from the speakers with strong fidelity, and the show's eclectic music soundtrack comes through with pleasing separation and powerful bass. Dynamic range is wide, but when the track perks up, the mixing can actually be a little too aggressive, leading to a few overwhelming sound design choices. Though McBride's hilariously inappropriate observations and tirades are the real focus here, the audio can be quite bombastic when it wants to be. There are times when some of the music and effects work is borderline obnoxious -- but really, what else would one expect from a show like this? HBO has provided a solid assortment of special features, including deleted scenes, outtakes, and hilarious commentaries on all eight episodes. All of the extras are presented in 1080p with DTS 2.0 sound and no subtitle options. 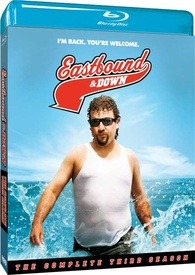 Commentaries - Star/co-creator Danny McBride and co-creator/director Jody Hill offer commentary on all five episodes on disc one. They're also joined by a variety of cast and crew throughout the tracks, including Steve Little, Katy Mixon, and David Gordon Green. Almost as funny as the actual show, these commentaries are all well worth a listen, and the amusing participants share several hysterical stories (many dealing with the difficulties of working with the baby actors). Season 1 Recap (HD, 4 min) - A quick rundown of the show's first season is provided. Season 2 Recap (HD, 2 min) - A quick rundown of the show's second season is provided. Commentaries - Hill and McBride provide commentary on the remaining three episodes and are once again joined by several members of the cast and crew throughout (including Craig Robinson). Like the last batch, these are all very funny listens, and there's even some worthwhile production info shared as well. Dinner with the Schaeffers (HD, 6 min) - This is an extended version of the bizarre dinner scene from episode two that features more shenanigans from Will Ferrell and a wonderfully weird story about frozen bowel movements. Deleted Scenes (HD, 48 min) - Twenty six deleted scenes are viewable together with chapter breaks. Most of this material was simply cut for time, and there's some good stuff here, including a few amusing references to He-Man and a fun Val Kilmer cameo. 'Eastbound & Down: The Complete Third Season' offers another hilarious assortment of raunchy misadventures in the life of Kenny Powers. Sidetracked by fatherhood, the character might actually be forced to grow up a bit, but he's certainly milking every last inch of vulgar immaturity for all it's worth. The video transfers and audio mixes are both strong offering a vibrant and occasionally lively experience. The special features are all entertaining and well worth your time, especially the commentaries which are almost as funny as the actual episodes. The show certainly isn’t for everyone, but for those open to its crass humor, it remains one of the funniest series on TV.